M-Audio isn’t the only game in town for affordable wireless MIDI. CME, the Chinese music equipment manufacturer distributed by Yamaha, has their own MIDI interface. And it looks like they might beat M-Audio to shipping a standalone MIDI interface — with a far greater range, to boot. Both vendors are claiming “first” (which isn’t really true no matter how you slice it). The big difference between the CME gear and M-Audio’s interface and keyboards is range. CME promises “full duplex” and an 80 meter range, unobstructed (should be less indoors). Let’s see, convert M-Audio’s 30 feet to metric, and, uh . . . well, basically CME wins on range. Of course, if you’re not planning on bodysurfing while playing your keytar, that’s unlikely to be the main factor, so what I really want to do is take these two units head-to-head. CME also gives us a detail M-Audio left out: how many adapter pairs can work at the same time. They promise a somewhat incredible 64 simultaneous pairs, which would be nice indeed. 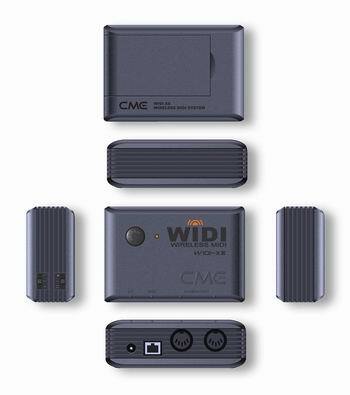 Other than those issues, the CME piece is almost identical to the M-Audio interface: 2.4GHz spectrum, AA batteries, plug-and-play USB (meaning it should be class-compliant on Mac, Windows, and Linux). The two even look alike, although the CME unit is much less compact than M-Audio’s. In fact, I’m extremely interested in the fact that these came out at the same time — makes you wonder if some key component became available and CME and M-Audio both decided to jump on it. If you want a keyboard with wireless, M-Audio is still your only choice, though CME may follow suit. I haven’t been this excited about two rival products since there were those two made-for-TV movies about asteroids hitting Earth. As soon as I can get both units in, I’ll be checking resistance to interference, latency, compatibility, reliability, and — out in Battery Park — outdoor range. Did I miss anything?